Victoria Crater, an impact crater located at 5.50°W 2.05°S in Meridiani Planum, on Mars, currently being visited by the Mars Exploration Rover Opportunity. It is roughly 730 metres wide and 70 meters deep. It is named after Victoria, one of the five ships of Ferdinand Magellan and the first ship to circumnavigate the globe. Along the edges of the crater are many outcrops within recessed alcoves and promontories, named for bays and capes that Magellan discovered. Spatial skills are necessary for mapping success and conceptual understanding in the geosciences. This study investigates the efficacy of using toy figures, toy buildings, digital plan-view photograph maps and digital photograph snapshots in increasing the spatial skills of children ages 2.5 to 9 years. A pretest-intervention-posttest design study with matched experimental and control groups (n=20) was conducted. The investigators examined children's performance in six skill areas: diminution in scale; identifying the simple perspective of another; mental linear displacement; mental rotation; using an aligned map and rotating an unaligned map into alignment; and identifying a more complex viewpoint of another. Pretest mean total scores were not significantly different. Posttest scores showed a twenty percent gain for the experimental group, but no net gain for the control group. Activities as described in this study can build a foundation of spatial skills needed for later geoscience map activities. A multi-week laboratory exercise in the Sedimentology course at UNC Charlotte investigates the sedimentary history of a 0.8 hectare (2 acre) pond on campus property. The pond watershed experienced changes in land use over 50 years that are documented using property records, aerial photography and sedimentological analysis. The laboratory exercise includes the tasks of mapping the watershed, surveying, coring, describing cores, preparing bathymetric profiles and stratigraphic cross-sections, and composing a scientific report of the sedimentary history of the pond. 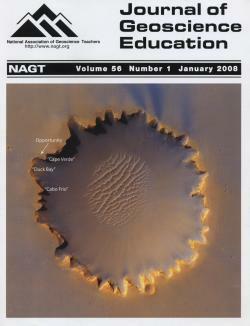 Students gain experience with field techniques such as reading topographic maps, land use mapping, triangulation and sediment coring, and with laboratory techniques such as core description, facies analysis, x-ray diffraction and grain size analysis. The choice of techniques used in this inquiry-based exercise was in part determined by the research questions that the students devised. Rather than learning those skills in discrete lab exercises, each component contributes to a large-scale research program the goal of which is to understand the sedimentary history of the pond. Furthermore, the report is prepared in stages (outline, rough draft and final draft) so that students receive feedback on how to prepare an illustrated scientific report. Writing the report in stages improved the quality of student work, resulting in a conference presentation. The students found that the pond experienced slow, organic-rich sedimentation when the watershed was vegetated, but that sedimentation rates temporarily increased due to construction of a nearby hospital. The goal of Minority Students Pursuing Higher Degrees of Success (MS PHD'S) in Earth System Science??? is to attract, engage, mentor and sustain the involvement of undergraduate and graduate minority students within the Earth system science disciplines. The pilot project for this new initiative, entitled the MSPHD'S in Ocean Sciences Program, provided yearlong opportunities for mentor/mentee engagement via academic, scientific and professional development activities. The 2003-2004 MSPHD'S in Ocean Sciences Program facilitated the involvement of 25 mentor-mentee partnerships during the May 5-8, 2003, Joint Global Ocean Flux Study (JGOFS) Program Open Science Meeting in Washington, D.C. MS PHD'S students received in-depth exposure to leading edge ocean science research, mentoring support from scientists responsible for these advancements, and insight into future marine research initiatives. 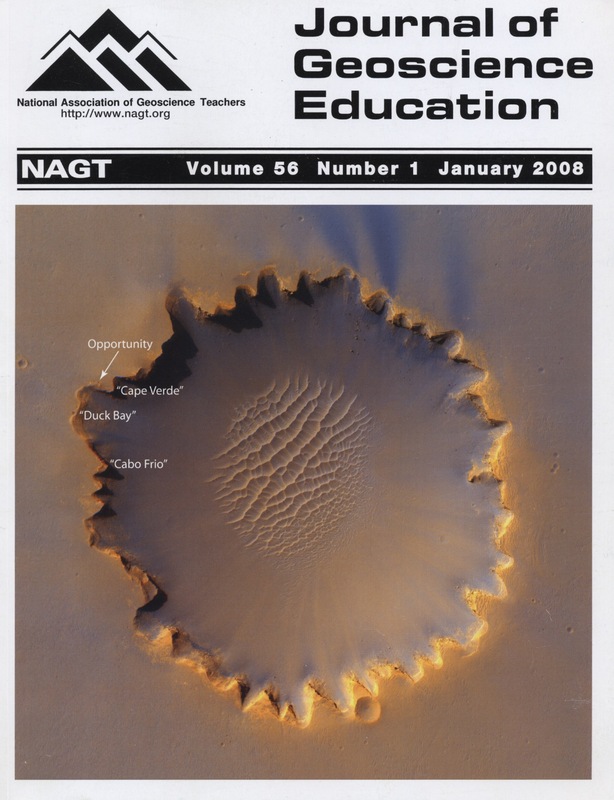 Evaluation data for this pilot project indicate that virtual and face-to-face mentoring, on-site professional development and community-building activities resulted in increased participant exposure to and engagement in the Earth system science professional community and served to better equip student participants to make informed post-baccalaureate academic and professional career decisions. Geological hazard mitigation is a complicated process that involves both detailed scientific research and negotiations among various community members who have a personal stake in the chosen mitigation method. A challenge for teachers is to incorporate both of these elements into their classes. To address this problem, we have spent six years in developing and testing a role-playing exercise based on mitigation of a dam outburst hazard on Ruapehu volcano, New Zealand. In our exercise, students undertake one of five different roles and decide, as a group, the best way to mitigate the hazard. We divide our lesson into four parts: an introduction, a meeting among members of the same interested party to discuss strategy, a meeting among different interested parties to find a consensus solution to the hazard, and a debriefing session. Discussions occur in the presence of a student facilitator and a recorder. Our role-playing exercise is designed to be completed in a single hour and fifty minute or two 50 minute class sessions. Students have responded positively to the use of role-playing to supplement lectures. The framework that we have used for our exercise can be readily translated to other hazard problems where different parties debate the best way to mitigate other natural or industrial hazards. Writing assignments were introduced to a large introductory Oceanography class at UCSB. The assignments evolved, over a period of 10 years, from papers handed in to the instructor, to online peer reviewed assignments using the calibrated peer review methodology. The assignments required students to acquire and plot data and use these data plots to create scientific arguments in support of a theory. The topics addressed plate tectonics, the Indian monsoon, the Earth's climate, and the world fisheries. The course activities were managed by the EarthEd software package, which supports course management functions such as online writing and peer review, image storage and upload, auto-graded homework problems, and course grade computation. Access to Earth data is integrated within the EarthEd software through the "Our Dynamic Planet" CDROM, Global Ocean Data Viewer, and links to other data browsers available on the web. Data representations are captured as images, uploaded to the student's image library (in EarthEd) and then can be edited and linked to the writing assignment text. Convenient commenting, scoring, grade curving, and posting is also implemented. The peer review assignments were successful in providing accurate grades for students, while reducing grading by the instructor by about 70% to 80%. Fudge is an excellent analog for basaltic lava and making or tasting fudge leads to memorable lessons on the importance of crystals in controlling the morphology of basaltic lava flows. In particular, students learn why 'a'a flows have rough broken surfaces, while pahoehoe flows are smooth or folded. Furthermore, fudge provides an interesting analog in lessons on the factors that control crystal nucleation and growth as well as how crystals affect magma rheology. Although the full process of making fudge from scratch is too long for a lecture demonstration, fudge can be incorporated into lessons on basalt flows by way of taste-tests, photographs or simplified experiments with pre-made fudge and syrup. Advanced students can run experiments during a laboratory period and examine the crystal textures under a microscope, or do their own experiments in small groups outside of the classroom. Evaluation with written quizzes shows that fudge demonstrations can be an effective aid for teaching the complex concepts of crystal nucleation and growth and their effects on basalt lava flows. The understanding of the mechanisms underlying processes such as self-organization, adaptation, emergence, which are characteristics of complex systems, is of paramount importance when teaching and learning science. Preliminary research on student understanding of complexity indicates that students tend to conceptualize dynamic systems in static disjointed terms, utilizing a linear-mono-causal approach which impedes a conceptual understanding of complex causal relations. Hypothesizing that student understanding of the principles of causality plays a fundamental role in the understanding of complexity, undergraduate science majors have been interviewed to explore their approaches to complex natural phenomena and document changes that occur in reasoning when a modified Aristotelian framework of causality principles is introduced. Results indicate that the understanding of emergence, downward causation, and self-organization are better conceptualized when students utilize the modified Aristotelian framework of causality principles.